Sony’s has announced that it is updating PlayStation 4 gaming console’s system software that will enable PS4 owners to play console games on PC Windows 10 & 8.1 as well as Mac OS X 10.11/10.12 or later desktops/laptops effective from April 6th onward. If you own PS4 console and update to latest system software then you can play games remotely with PS4 remote play, over a shared WiFi network or on the internet. Windows 7 or older Windows OS users can’t utilize new PS4 remote play feature which makes playing PS4 game from anywhere possible. In order to play PS4 games on Windows & Mac PCs/laptops make sure that you have PS4 console with latest updated operating system to use PS4 Remote Play, Dualshock 4 controllers (both wired and wireless types will work), Sony Entertainment Network account and fast internet connection for playing heavy console games on computers. Use of home network is recommended, avoid public networks for playing games as it may expose private data to hackers or online fraud. 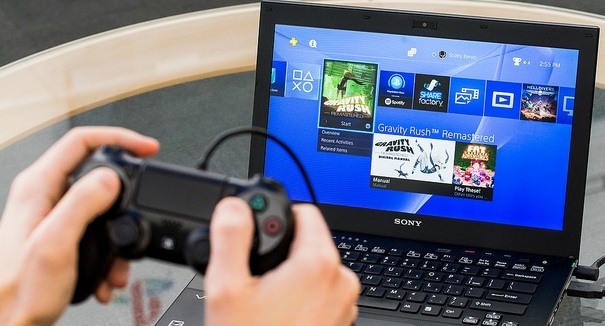 Playing games using mouse or keyboard is not supported by PS4 Remote Play, you got to have DualShock 4 controller connected to USB port of PC or establish wireless connection using Bluetooth. However, there is an option to use third-party emulator programs. There is one drawback of playing PS4 console games on PC Windows 10/8.1 & Mac computers with PS4 Remote Play that games will run at maximum 720p resolution, as full resolution for games is not supported, future updates could support playing at higher resolution. Select display resolution and frame options from settings before playing games; set low resolution if internet connection is slow. Latest software update on PS4 brings more integrated social media changes to the fore. If you want to avoid constant notifications or want to play alone for a while and don’t want to be disturbed then switch PlayStation Network profile status to offline, so that no one see you active on the network. With PC and PS4 Remote Play compatibility, new avenue has been opened for PC users to play console games on desktops/laptops, which would otherwise have been impossible. Sony intents to widen its user base by targeting PC users, this could also be seen as a move to lure users away from PCs to PlayStation console by familiarizing them with PS4 gaming. Whatever the motive one thing is for sure that computer users are the real winners here as they will get to play wide range of console games now on computers including PlayStation exclusive titles.